STEM Activities provide a wonderful opportunity for integrated learning, hands on discovery, and adaptations to ensure lessons reach students of all levels of ability. STEM Activities do a brilliant job of engaging students when done properly. 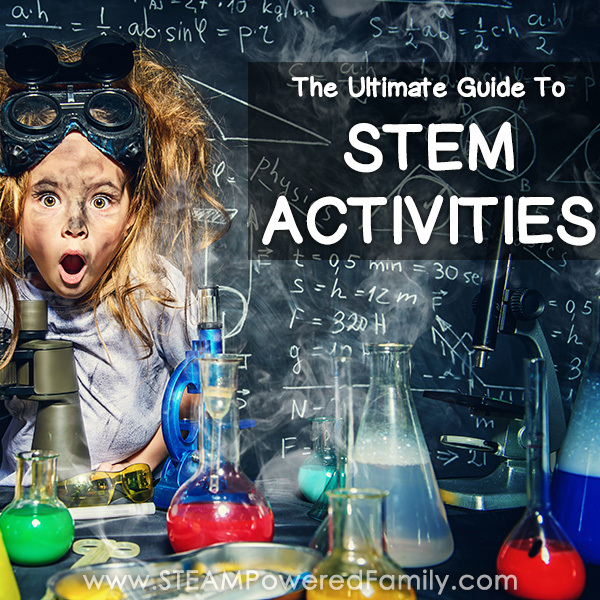 Whether you are new to STEM or have been using STEM principles for years, this articles covers all aspects of STEM Activities, from definitions, to lesson planning, to many STEM Activities to inspire you and your children. My passion is promoting positive forms of education that foster healthy child development. I’m constantly seeking out new, engaging activities and lessons that will ignite a passion for learning. My goal is to raise passionate life-long learners and help my readers do the same. I’ve seen the positive influence STEM Activities can have on children’s learning and most importantly, their love of learning. Because at the end of the day if we raise children that don’t love to learn, then I really believe we have failed them as educators. STEM helps to foster a passion for learning, which is the greatest gift education can give all children. Interested in learning more about STEM Activities and STEM education? I’ve compiled some of the most important information here to help you get started. The first thing we need to do is define STEM Activities. STEM is an acronym that stands for Science, Technology, Engineering and Math (referred to as pillars). It is an integrated teaching strategy that combines at least two of the pillars in the lessons and activities. 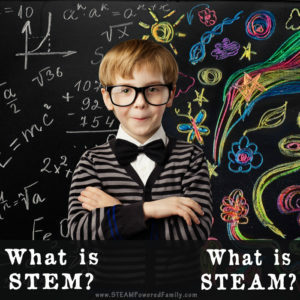 You can learn more about STEM and the definitions here in: What is STEM? What is STEAM? Children need to be engaged to learn. Because STEM is child centered using inquiry based principles, we allow children to take ownership of their learning. As their teachers we can support them in following their passions, we can get creative with our lessons, making them fun and interesting. With STEM we are teaching skills the way they will be used in the real world. If an education produces a person who has lost their passion for learning, lost their curiosity, and removed their motivation to continue learning and growing, then it has failed. Education needs to support children in their learning journey, where ever that journey takes them in life. It should inspire and foster their passions to create successful, life-long learners. STEM transforms school and education from a place to a state of mind. Teachers that employ STEAM principles make real-life connections in their teachings. School becomes a state of mind rather than a place. School is not about going to a campus but about the experience of learning. With STEAM we are always growing, always experimenting, always thinking and always learning. 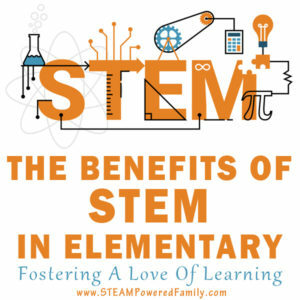 Learn more about the benefits of STEM Activities for Elementary. 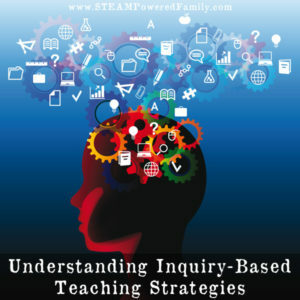 What are Inquiry Based Teaching Strategies? In the previous section we mentioned inquiry based teaching principles and strategies. STEM activities engage students by promoting inquiry and questioning, then letting that form the framework for the lessons and learning. From structured, to controlled, to guided, to free inquiry, students that are educated through the various levels of inquiry based learning develop strong skills in self motivation. They also develop the ability to guide their own learning and education. Essentially, they become their own best teacher. This is a fantastic skill for continued growth and success throughout a person’s life. One of the great things about STEM activities and lessons is how adaptable they are. You can adjust almost any STEM activity to accommodate for different ages, abilities, interests and even group sizes. This is something I do regularly as I adjust lessons to accommodate my delayed learner and my gifted learner. STEM makes teaching those diverse needs, at the same time, easier. 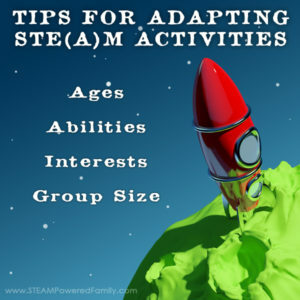 Learn key tips for adapting STEM activities. 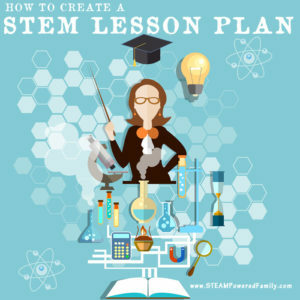 Once you have started embracing STEM principles you will want to start developing your own STEM lesson plans and STEM activities. In fact, this is one of the great benefits of STEM: the ability to customize, adapt and develop plans and activities to suit your students. Whatever their passions and interests, you can apply a bit of creativity and come up with a fantastic, integrated STEM session. STEM Kits – STEM in a box! With the ever increasing popularity of STEM there has been a lot of new products entering the market that provide STEM in conveniently, prepackaged kits. 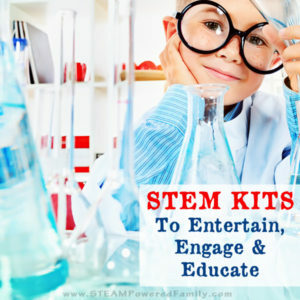 These STEM Kits are a fantastic opportunity to try new STEM concepts, dig a little deeper into a topic, or to simply have some fun. Plus, the biggest bonus? Most of the kits and boxes, include everything you need! This can be a huge sanity and time saver. STEM Kits come in many different forms. Want to learn about how composting creates energy? Or maybe you have a young electrical engineer that wants to learn about circuits? Or perhaps you want to explore building a self contained eco-system? There are so many kits available, it’s simply about finding the one that ignites your passions. Another form of STEM Kits is the monthly subscription box style. With these programs you get a new box packed full of learning every month. This keeps the learning going all year round with new inspiration, projects and ideas delivered right to your door. Whatever your interest, there is a STEM Kit somewhere that will help to advance your learning. Check out some of our favourite STEM Kits in this article. The best way to come up with innovative, inspiring and exciting STEM activities is to study what others are doing! And that is what we love to do here, share our STEM Activity ideas, STEM challenges and STEM projects. Here are a few comprehensive resources on specific topics. 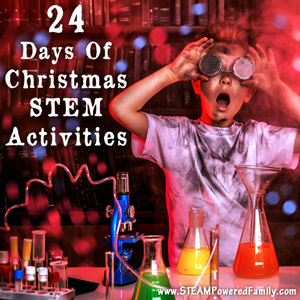 The holidays and seasons can provide fantastic inspiration and motivation for hands on learning and STEM activities. Something almost all of us have access to all the time is water. Water makes a fantastic starting point for some entertaining and educational STEM activities and challenges. 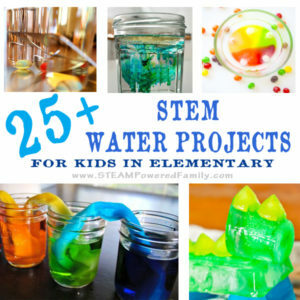 Water projects for kids is a sure fire way to get kids excited about STEM. One of our favourite tools in our Tinker Kit is our non-contact digital thermometer. Kids love using this device to measure reactions during experiments. 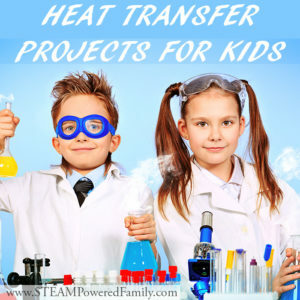 So it’s no surprise that Heat Transfer Projects are very popular. 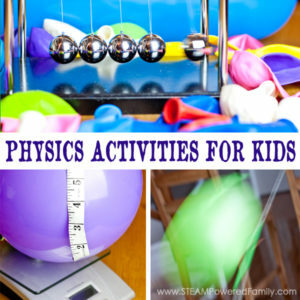 Physics activities and exploring Newton’s Laws of Motion doesn’t need to be a University level study. With the right activity, (and who doesn’t love playing with balloons? ), kids can explore these principles. With the hands on nature of this study, students will remember what they learned about Newton when it’s time for those advanced studies. Machines are a natural source of wonder for most kids, which makes mechanical engineering for kids a fantastic STEM activity. Leonardo da Vinci was an inspiration for many and a innovative mechanical engineer, making da Vinci inspired STEM lessons a fantastic addition to your lesson plans. 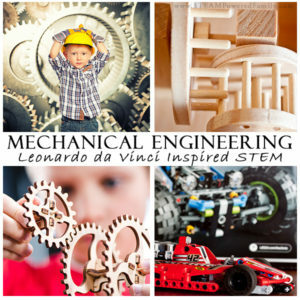 Check out Mechanical Engineering for Kids – da Vinci Inspired STEM for more ideas. Chemistry is another subject that often strikes fear into the hearts of students. But there are many ways of introducing Chemistry and the Periodic Table of Elements that makes it accessible and engaging. 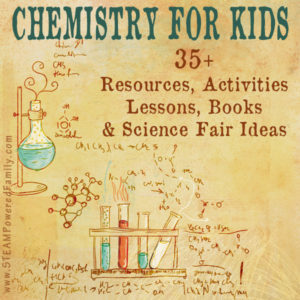 Check out Chemistry for Kids for lots of inspiration. 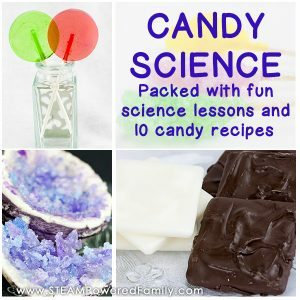 Candy Making – A great STEM Activity with a tasty treat! Right now my kids are obsessed with hands-on learning and figuring out how things are made. So when we started into our study of candy science and the science behind candy making they were instantly enthralled! This is a great topic focusing mostly on chemistry but with math, temperatures, altitude and more also covered. 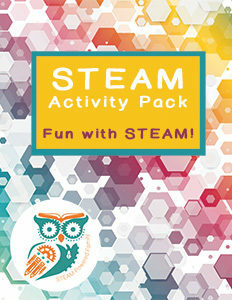 Grab your free STEAM Activity book! I’ve put together a fun little STEAM activity book that includes a colouring page, vocabulary words, word search and crossword puzzle. You can grab your copy in my shop or TpT store. 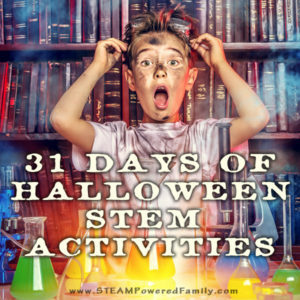 At STEAM Powered Family we love doing STEM Activities. Here is a list of some of our most popular activities. Simply click on the images to be taken to the article. 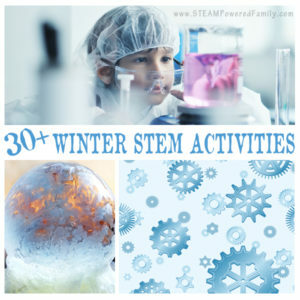 Circuit Bugs Milk Plastic Make It Move STEM Challenge Wind Powered STEM Unit Study Bottle Rockets Memory Game Circuits & Coding Study Winter STEM Activity – Salt & Ice Secret to Growing Big Crystals Engineering an Ice Lantern Zoetrope & Benham Disk Challenge Simple Science – Melting Magic Why Does Water Rise? Our shelves are full of books with STEM Activities. They are fantastic for giving us inspiration for our lesson plans and just to find something fun and exciting to do on a rainy day! These books are packed full of ideas. 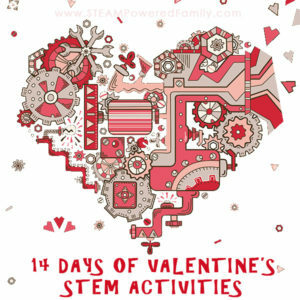 MORE GREAT STEM SITES WE LOVE! 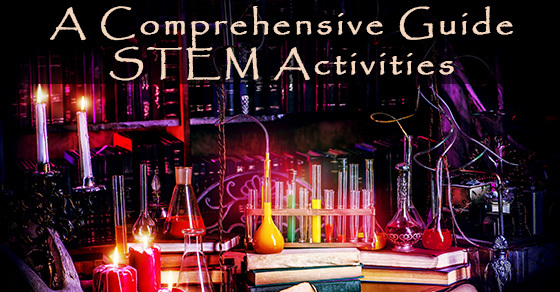 This guide is far from exhaustive on the topic of STEM activities, but I will continue to add to it and grow it as I come across even more valuable STEM resources. Looking for more STEM ideas and inspiration? Join our mailing list and you will get weekly emails with all the latest we have uncovered.